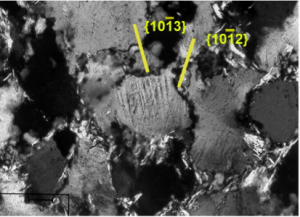 An independent investigation of PDFs in samples from the Azuara impact structure (a polymictic dike breccia and Pelarda Fm. 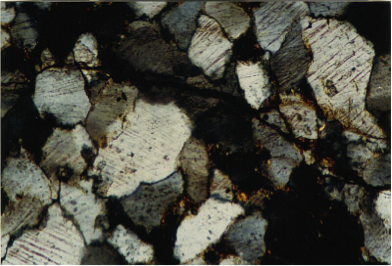 ejecta) was made at the Geological Survey of Canada by Dr. Ann Therriault (Therriault 2000). 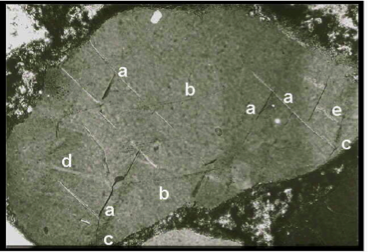 She analyzed the crystallographical orientation of PDFs in quartz (Fig. 1 D) and other parameters such as density, sharpness, spacing, and spreading over the grain (Fig. 1 C). And we cite from her report: Up to five sets of PDFs per grain were observed. The spacing is 1 µm or less, the PDF density high. Practically all sets are decorated. 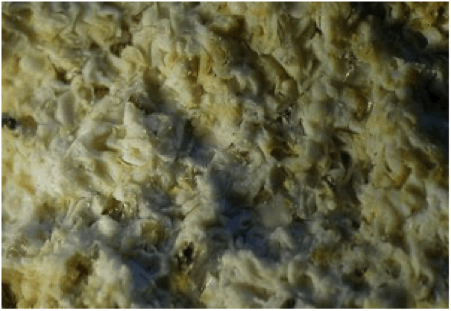 All shocked grains have reduced birefringence of 0.004 – 0.008. Fig. 2 A, B. Diaplectic quartz crystal and a sandstone fragment completely transferred to diaplectic glass. These examples of strong shock in the Azuara structure have frequently been published earlier. Fig. 3 A, B. 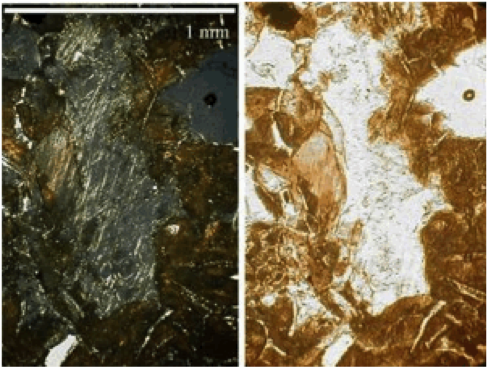 Melt glass from a strongly shocked polymictic breccia in the Azuara impact structure. 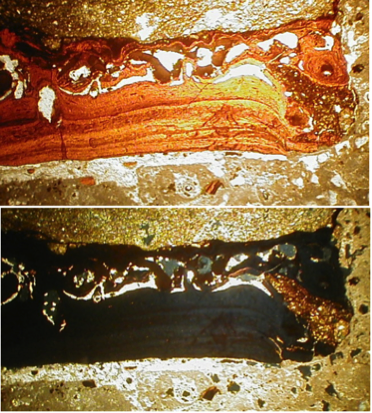 These examples of strong shock in the Azuara structure have frequently been published earlier. Fig. 4. 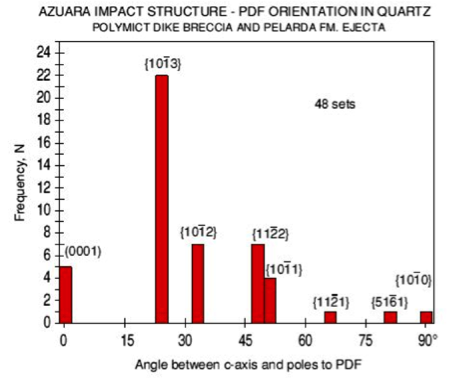 Rubielos de la Cérida impact structure: Diaplectic glass and multiple sets of PDFs in quartz. Published earlier. Fig. 5. Rubielos de la Cérida impact structure: feldspar grain completely transferred to diaplectic glass. Published earlier. Fig. 6. 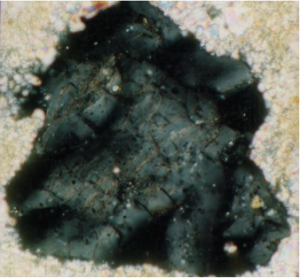 Rubielos de la Cérida impact structure: melt glass; suevite from the Barrachina megabreccia. Published earlier. Fig. 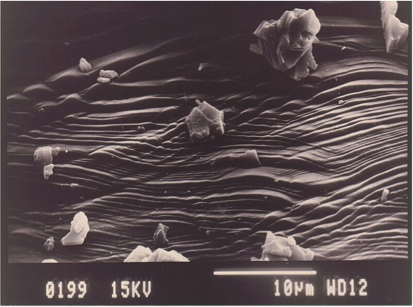 7A, B. Rubielos de la Cérida impact structure: silicate melt rock composed of more than 90% pure glass. 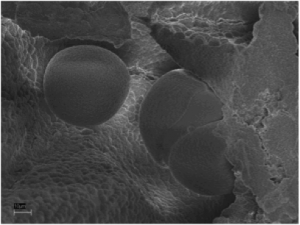 Under the optical microscope and the SEM. Published earlier. Fig. 8. Quartz grain from a highly shocked polymictic impact breccia, Azuara impact structure, exhibiting at least four sets of planar fractures. Here we explicitly cite the text in the French & Koeberl article: “Multiple PF sets are definitely the product of impact-generated shock waves; they are developed in the rocks of established impact structures while being absent in the surrounding undeformed country rock “. This image with the Azuara multiple PFs has been published on many occasions, for the first time already in the early paper of Ernstson et al (1985) on Azuara. The figures shown here are only a very small extract of the host of evidences of clear shock in the Azuara and Rubielos de la Cérida impact structures (also presented here on our impact websites), and we request Langenhorst, Koeberl, Spray and others to directly and straightforward explain why this clear shock evidence matching all impact literature and findings in impact structures all over the world in their opinion is no shock. We ask them to explain why they ignore the sound investigation (the original 31 pages report being at our disposal) of their colleague Dr. Ann Therriault on the Azuara PDFs. With regard to the above presented, on many occasions published clear impact evidence for the large Spanish impact structures, and the reaction of a few exposed impact researchers we clearly see what obviously works: again and again negating, suppressing, disqualifying, manipulating and wrongly or not at all referring to the published Azuara and Rubielos de la Cérida material, and we only mention Langenhorst & Deutsch (1996), Langenhorst (2002), French & Koeberl (2010), and the Canadian Earth Impact Database at the New Brunswick university, managed by John Spray. Of course, this stimulates quite a few other researchers to uncritically adopt this seemingly mainstream “wisdoms”, and in a few cases they even have “an ax to grind” (examples are well documented). A typical example of what works is the Canadian Impact Data Base. In a written inquiry Ferran Claudin asked John Spray why the Azuara structure formerly established as a proven impact had been eliminated from the database and why also Rubielos de la Cérida despite overwhelming impact evidence has not been recorded. Moreover, Ferran offered to send him reprints of all published articles on the impacts. John Spray wrote back that Ferran were free to do it but that he, John Spray, would not read the articles. And hence the Spanish impact structures are further on being ignored in that database. In more detail we’ve written about this (mal)functioning of science here on our websites (see Earth Impact Database – Database of Earth Impact Structures – Meteorite Craters and Controversy and Azuara shock effects. To underline the “what works” in manipulating science we explicitly refer to the French & Koeberl article under discussion and how the Spanish impact structures are discredited. French & Koeberl are writing of “recent reports of evidence for impact” and refer to the 1985 (!) very early paper by Ernstson et al. on the Azuara impact. In addition they refer to the Ernstson et al. paper of 2001 that in fact could be termed “recent”. However this is not a report of evidence for the Azuara and Rubielos de la Cérida impacts but a report on special impact features in shocked conglomerates (Ernstson et al. 2001) related to these impact structures. The crucial point in this connection is the fact that the 1985 and 2001 papers are referred to by French & Koeberl, but not the other basic publications of Ernstson & Fiebag (1992), Ernstson & Claudin (1990), Hradil et al. (2001), Claudin et al. (2001), Ernstson et al. (2001 a, b; 2002) on the prominent impacts in Spain. Instead, and this must be termed a masterpiece of manipulating science, French & Koeberl refer to the comprehensive Ernstson et al. 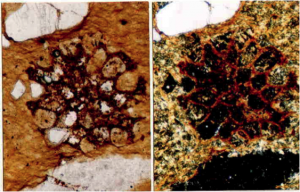 (2002) paper on Azuara and Rubielos (summarizing ALL geological, geophysical, mineralogical and shock metamorphism impact evidence) NOT as a proof for impact but solely in relation with the above mentioned conglomerates. Thus, they declare the Azuara and Rubielos de la Cérida impact evidence as non-existent and are speaking of “possible impact structures” and, to cap it all off, writing that “no other, more convincing, evidence of impact has yet been provided for those two Spanish structures.” Once more: a masterpiece of manipulating science. The question why scientists behave like just described for the impact researchers Langenhorst, Koeberl, Spray and others is a long and old story exemplified from all scientific disciplines, and envy, resentment, even malevolence, personal payback, striving for power, and financial aspects (funding) are always found as impetus. 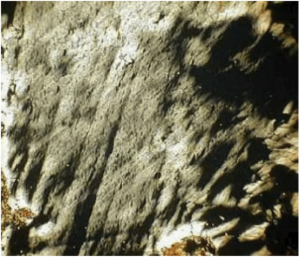 In the special case of the Spanish impact structures we well understand (without approving it) that a few Spanish regional geologists are doing all they can to eliminate the impact structures and the giant Azuara impact event, that considerably changed the younger Tertiary geology of Northern Spain, from the geologic scene. They have worked for decades in the regions of the impacts, they have written big theses on the regional geology, and they are now confronted with a new geology while not understanding impact processes and impact geology (which we have addressed on the Controversy pages). The case with Koeberl, Langenhorst, Spray and others is different. Although they have obviously never been in Spain to study the fantastic impact scenarios, THEY understand impact, and THEY are well able to read and verify the classic impact and shock evidence for Azuara and Rubielos de la Cérida presented in the many publications. And they probably well understand that the big multiple impacts of the Azuara event are more or less exceptional among the very big terrestrial impact sites with the innumerable and easily accessible highlighting outcrops of impact geology and impact features, not to forget the constellation of an extended crater chain establishing the 80 km long Rubielos de la Cérida impact basin that is unique on earth. And this is the very point: THEY (in their opinion being the impact Big Boys) are NOT involved in the investigation and research of this spectacular impact. And along the lines of “If I can’t have it, then nobody else should have it either“, or “If I can’t have it, then I ruin it for you” the Spanish impact structures are massacred. Although the article by French & Koeberl (2010) presents a useful compilation of impact features, the unmissable manipulation of scientific results already practiced earlier also by Langenhorst & Deutsch (1996) and Langenhorst (2002) and focused on the large Spanish Azuara and Rubielos de la Cérida impact structures does serious harm to research, and it does impact science in general a bad turn – to say the best of it. and at the same time they ignore exactly these clear shock features in the Spanish impact structures (see our Figs. 1-8). That is they defraud the reader when they are speaking of “possible” Azuara and Rubielos de la Cérida impacts and “no convincing evidence”. 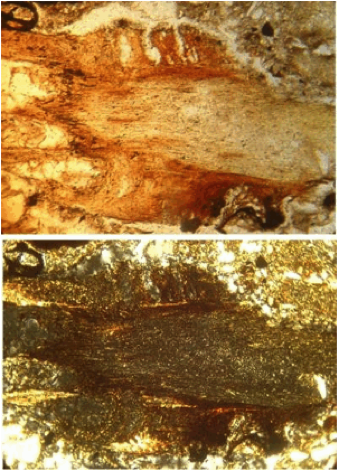 Hence, the heap of structures and related references addressed in the French & Koeberl paper should not hide the fact that the article has to be considered with caution and that it is obviously not a solid and reliable reference in impact research, all the more as important impact features like, e.g., impact shock spallation in rocks and minerals are simply missing. French, B.M. & Koeberl, C.: The convincing identification of terrestrial meteorite impact structures: What works, what doesn’t, and why. – Earth-Science Reviews, 98, 123-170, 2010. Langenhorst, F. : Shock metamorphism of some minerals: Basic introduction and microstructural observations. – Bulletin of the Czech Geological Survey, Vol. 77, No. 4, 265–282, 2002. 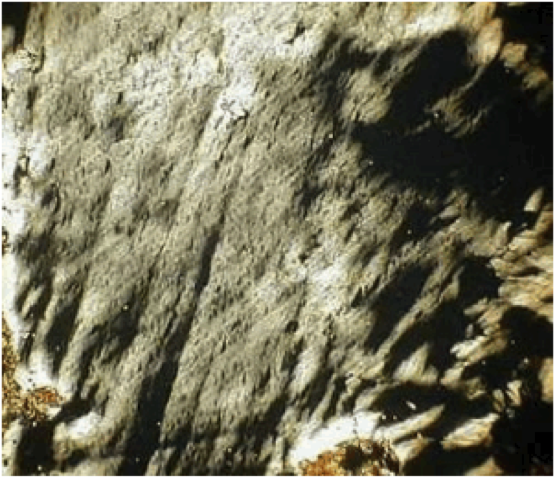 Langenhorst & Deutsch (1996): The Azuara and Rubielos structures, Spain: Twin impact craters or Alpine thrust systems? 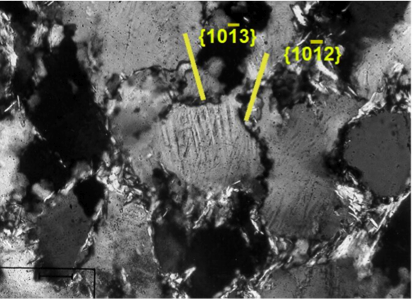 TEM investigations on deformed quartz disprove shock origin (abstract). Lunar and Planetary Science, v. XXVII: 725-726.